GlobeScan have recently been trailing this year’s results for their annual global tracker, which has prompted a bit of a geekout in Climatesockland. These guys at GlobeScan seriously mean business with their tracker: they’re now up to 27 countries, including some places where fieldwork for a nationally representative poll takes quite a bit of organising (I dread to think how you would do a truly nationally representative poll in Indonesia for example, but so they claim to have done). The good news, poll fans, is that those nice people at GlobeScan have sent me some of the data that they hadn’t previously published (unlike the PR polls that are so irritatingly reported without any published data to back them up, this was a piece of private polling, so GlobeScan weren’t governed by the rules of the British Polling Council to release the data). 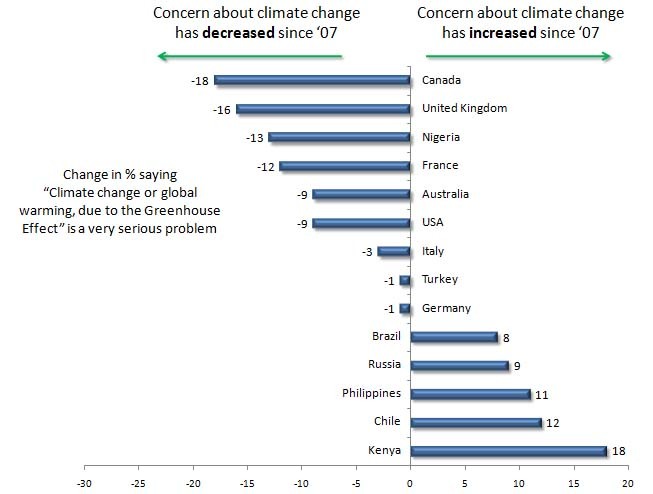 That looks to me like a significant fall in concern about climate change between ’09 and ’10 that seems to be felt across the world. This would seem to challenge the usual explanations for the fall in the UK of concern about climate change between late ’09 and early ’10. A particularly cold winter can’t possibly be the explanation for this given that ’10 seems to have been one of the hottest years on record globally. Similarly, it’s very hard to believe that the UEA emails (and other challenges to climate science) made enough of a splash in all of these countries to have driven these changes. Overall, a slight fall and some quite sharp movements up and down, but much less change between ’07 to ’10. So it may be that the fall from ’09 to ’10 brought the levels roughly back to where they were in ’07, rather than taking them to a new low. 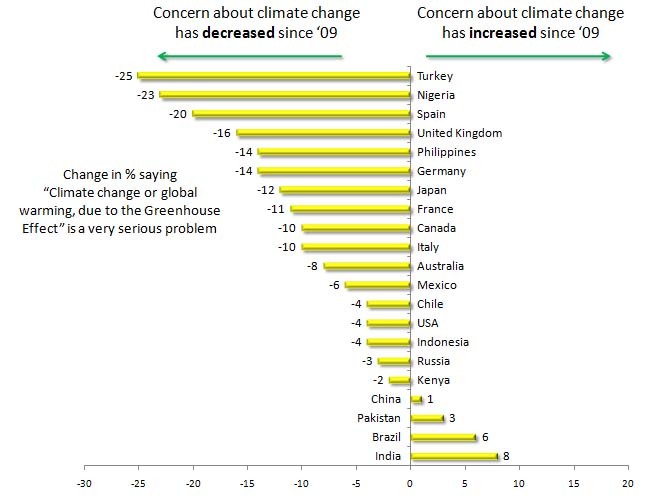 So at least in these countries overall, climate change appears to be less of a concern now than it has been since before 2006. 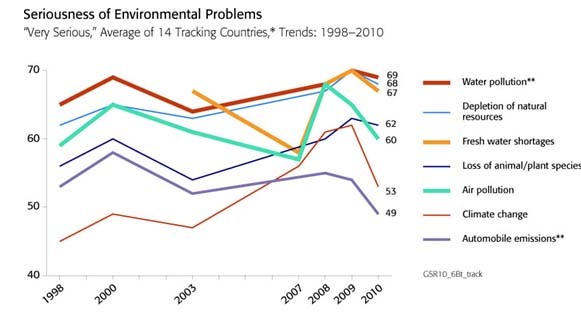 Throughout the chart, and particularly in recent years, concern about climate change moves in roughly the same way as the other environmental concerns. 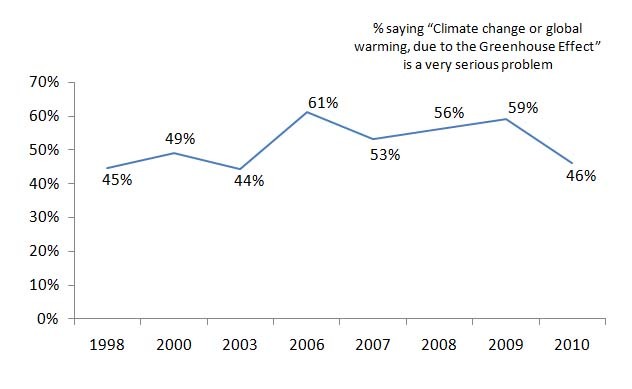 This looks like pretty strong evidence that levels of concern about climate change are connected to factors beyond the usual obvious ones like the weather or questions about climate science. 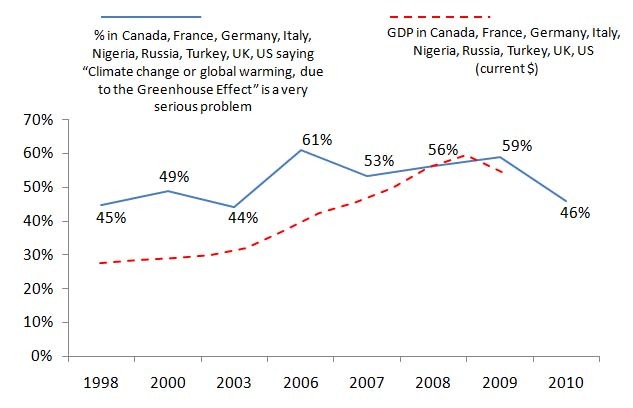 It’s not a perfect fit, but it looks rather like, at the global level, the state of the global economy is really quite good a predictor of attitudes to concern about climate change. This isn’t to say that it’s the only factor. Once you go deeper than the global level, it doesn’t seem to hold quite so true. 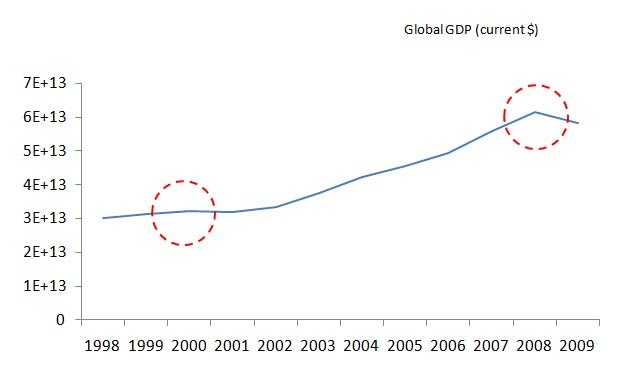 For example in India, concern rocketed between ’98 and ’00, then barely moved for the next seven years. But just from this first look at the GlobeScan data, it does seem that we’ve got good evidence that there’s been a global fall in concern about climate change – and that we have a strong contender for an explanation. Whether the global economy drives concern about non-environmental issues will be an interesting question to explore further. It’s occurred to me that the graph above would make more sense if it’s based on the economies of only the countries for which we have climate polling data. The version below makes that change, and also makes the direct comparison with the % saying that climate change is very serious. I wouldn’t say it makes much difference to the picture, and the correlation still isn’t perfect, but nonetheless this chart gives a good suggestion that, for all the sound and fury about the UEA emails and the characterisations of a polarised debate, the economy may be the main cause of the recent drop in concern about climate change. If it really were, I would expect to see a similar drop in concern about other issues that aren’t directly connected to the immediate economy (like immigration, disease or international poverty). This entry was posted on Thursday, January 20th, 2011 at 22:45	and is filed under Climate Sock, Climategate. You can follow any responses to this entry through the RSS 2.0 feed. Both comments and pings are currently closed.